These are some of the common things that I hear from those who have started on the path of awakening. Before we get into how to integrate back into your life after your awakening, let’s first talk about integration. In short, integration is the embodiment of the wisdom, realisations and revelations that you’ve received during your spiritual practice. Sometimes the realisations and the revelations may be so subtle that you may not know it tangibly but you can feel that there’s a shift within you. It’s about incorporating what your mind understands now with your heart, your soul and your physical body. It’s about allowing this new level of awareness and flow of energy to move through you without resistances. It’s about following through by taking action and practising what you’ve internally understood during your awakening. It’s about mirroring the new awareness on all levels of physical, psychological, emotional, transpersonal and spiritual planes. It’s about walking the talk. Now this alone might raise so many questions. "How long does it take to integrate? Does integration happen only once? What if it affects my daily life?" I’ll try my best to answer these questions in the next paragraphs below. Integration is important because it’s really about connecting the knowledge and the awareness to our heart. For example, during your spiritual experience, you realise that you’ve been judgemental of others. As a result, you haven’t been treating the people around you with love and compassion. At this moment, this is awareness. Awareness becomes wisdom - only when it sinks into your heart. Then you start to feel - feel what others feel when you say or do certain things to them. This is when your heart starts to learn that when you hurt others, you hurt yourself too. This is when we become empathic. During your experience, you had a profound realisation that drinking alcohol is blocking you from your connection to the source. Consequently, you also realised that you’ve been using alcohol as an escape mechanism to avoid your shadows. This realisation will simply be an awareness unless you follow through after the experience - by not drinking the alcohol or cutting it down. Then this becomes an integrated experience. The embodiment of the wisdom. It’s great to talk about the realisations and revelations but if we don’t follow through then it’s just a realisation. The tricky part in this process is, by not integrating, spiritual bypassing can happen. I’ll write more about this in the another article. Now that we know what integration is and why it’s so important, I want to talk a bit about why I emphasise a lot on bringing the awareness down into the heart. As someone who grew up around extremely intellectual people, I thrived on intellectual conversations. I still do. There are things in life that defy logic, intellect and that are larger than who we are. Whether you call it your higher self, higher power, god, source or universe, when we shift from collecting intellect from reading to having the direct experience where we feel deeply from the heart, then we start to see the world through a different pair of eyes. As much as logic is important, when we bring the heart along our journey, and let it lead, then we will be able to shift our reality in ways we never thought possible. Gregg Branden, the pioneer in bridging the Science and Spirituality, has demonstrated many times how the electromagnetic fields in our heart affects the electromagnetic fields on earth. Dr. Masaru Emoto also talks about how the lake water in Japan got cleared from algae after a few hundred people gathered with the same intention to chant prayers. These examples show that when we drop into our hearts and have a clear intention, it changes the frequencies and vibrations on the quantum level - and then manifest on the physical level. In that process of having a direct experience through spiritual awakening, connecting deeply to our hearts and opening ourselves up to a new level of awareness, we feel free and in flow - until we hit a wall. Spiritual awakening is like hand gliding. First we get into the air, we get to see the world from above, we get to be among the birds and the clouds. But at one point, the fears come up - Will I hit that mountain? Will I hit the trees? Will the hand glider work properly? And at one point, we reach the ground. We miss the high but we also feel a little shaky. Going through spiritual awakening is also like peeling the onion. Or what I call; healing the many layers. When we open ourselves up for a new experience, first we feel bliss from the expansiveness that we’ve never felt before but it also unlocks all the doors that we’ve managed to keep shut to suppress the emotions we didn’t want to deal with over the years. The emotions that we think are bad - hurt, pain, misery, regret, anger, etc. - simply because we’ve made a judgement that they are bad. And now suddenly, it feels as if we’ve opened the pandora box. All the suppressed emotions come to surface. This isn’t a bad thing. This is a release. This is part of letting go. Or another type of resistance may be about the future that’s no longer certain. It’s not surprising for many to leave their jobs, partners and circle of friends that no longer fit into their new perspective. The life that we once lived, or a part of it, is no longer relevant. Suddenly they find themselves alone on their own, on their path. They feel lack of support and misunderstood by those around them. They start to feel lonely. They have to deal with the projections from those around them. Again, this isn’t a bad experience. Like I always say what’s good is good and what’s bad is also good. When I started on this path, I was in a successful career making the income that I’d always dreamed of. It was all about status, money and material possessions. However, after the awakening, that life was no longer relevant for me. That meant, either I could continue treading water or I could gather up some courage to take this opportunity to change my life. Of course, I wouldn’t be writing this if I hadn’t chosen the latter. Here, it’s important to understand that we all live in an ecosystem; a system where we’re all stabilising each other with common interest and vibration. When one of us start to shake things up and move out of that ecosystem, it also has an impact on the ecosystems of those around us. That’s why it’s important to understand that when we go through spiritual awakening and major life changes, those around also go through that process - in their own way. Suddenly they feel uncertain of their relationship with you and they may even feel threatened by your actions. This is when they will either project their fears onto you or hold you back - not out of bad intention but out of fear of losing you and losing their balance. This is when things can get difficult. Not only do you have to deal with the uncertainty of your next steps, you also have to deal with those around you. This is when you may say “It’s so difficult” and give up. Hang in there. This is part of the Hero’s Journey. The Hero’s Journey is about the path one goes through in order to become awakened - to become a hero in their own life. Everyone goes through Hero’s Journey in their own way. Whether you’re an entrepreneur, a lightworker, a mum or a teacher, the trials and tribulations in life can be our initiation to this path. 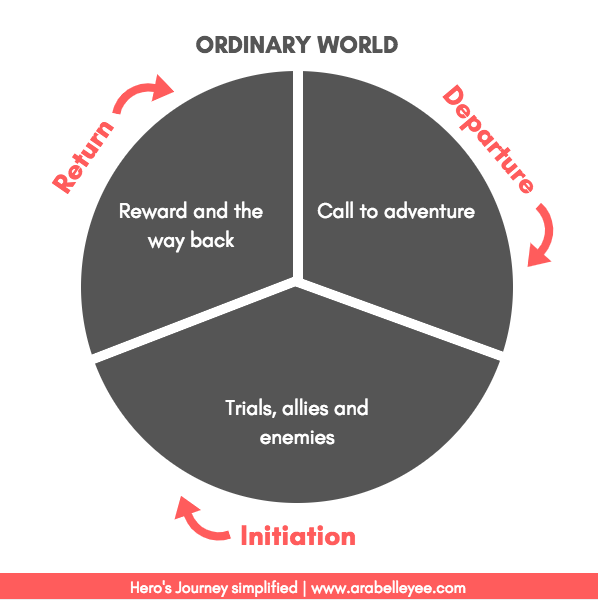 The Hero’s Journey goes through three phases; Departure, Initiation and Return. This is where the hero leaves the ordinary world, a safe place and the everyday life to answer the call for adventure - leaving the loved ones behind. She then faces with fears and doubts of whether she’s up for the task and makes a decision whether to move forward or retreat. If she chooses to move forward, then she confronts the trials and tests of life. This is where she faces her own inner demons, outer enemies and the curveballs that life throws at her that test her commitment and strength. The length of this phase depends on the person and their destiny. Once she’s passed all the tests and remained committed, then she gets rewarded with the elixir (lessons, wisdom, courage, etc.) and becomes a changed person. This is when she decides to go back to the ordinary world where she comes from, to unite with her community to share, teach and impart the wisdom she’s learned on her journey. Most of us go through this cycle of Hero’s Journey over and over again. Some of you are at the start of the Departure phase, some in Initiation and some in the Return phase. However, understanding this journey help us remember that trials and tribulations are part of the package but if we choose to do the work, then we will then be rewarded. Then we will be able to make a positive impact in the lives of those who love. Sometimes walking on the spiritual path happens out of a tragic experience, sometimes out of curiosity, sometimes out of the calling and sometimes by chance. Either way, it’s up to us to make a choice whether we want to do the work or not. And if we choose to do the work, it won’t necessarily be easy but it is out of the difficult challenges that we gain profound life lessons. "It is out of the difficult challenges that we gain profound life lessons." As I mentioned before, I believe that integration has to happen on the mind, body and soul. For many people, once they step onto the spiritual path, they treat everything on the spiritual level but this is when we can create spiritual bypassing and fail to deal with our shadows. Integration has to happen on the psychological level as well from the therapeutic perspective. No, you don’t have to be in therapy at all - in fact, this can be counterproductive. But there are so many ways that you can integrate on psychological level through simple ways. Also after the spiritual awakening, it’s important for us to bring the experience back down into our bodies and ground ourselves. So here are some ideas that you can get started, if you haven’t already to start your integration and grounding process. They key here is not to just do it but to have an intention of why you’re doing it and pay attention to how these activities are helping you integrate and progress in life. One last note is that once we’ve gone through an experience, it’s natural for the western mind to expect massive changes in our lives. Sometimes they do happen but most of the time, it’s the subtle changes that compounds over time. Everything around us will always mirror the changes within us and we can look at the circumstances that happen in our life as a barometer and a reminder of where we are with our spiritual path, progress and integration. So please note that integration, in another word, embodiment doesn’t have to be big. It’s about how we treat others, how we treat ourselves, how we respond to situations and how we show up in our life.